If you’re ready to set up your pipeline in a CRM platform, congratulations! You’ve officially graduated from the spreadsheet and are moving on to bigger and better sales goals. We even put together a guide to help you build your sales pipeline in a way that aligns with your sales process: The Step-by-Step Sales Process: How to Build and Manage Your Pipeline. Once you start moving leads through your pipeline, you might wonder about the difference between leads vs. opportunities vs. prospects. How do your contacts evolve as they move through the stages of your sales process? What qualifying actions must be taken in order to turn leads into opportunities into customers? This article will explain how to define, qualify, and manage leads and opportunities as they move through your pipeline. In the world of sales, “leads” and “opportunities” can refer to the same group of contacts at different steps of your sales cycle. Understanding the difference between these two terms can help you take full control of your pipeline and sales process. So, let’s get the differences straight. A sales lead is a contact or account that you have yet to qualify. They might be a name on a list of contacts collected via research, third-party data, referrals, or inbound marketing – or maybe they responded to one of your cold emails. Whatever the case, a lead may or may not be a potential buyer. You don’t know if they have the interest, budget, or authority to make a buying decision – and you can’t say for sure that they’re a good fit for your solution until you qualify them further. A sales opportunity, on the other hand, is a qualified contact or account. They’ve spoken to your sales team, expressed interest in continuing the conversation, and maybe even agreed to hear a sales pitch or look over a proposal. Think of opportunities as leads who’ve passed all your qualification criteria and graduated to legitimate sales opportunities. 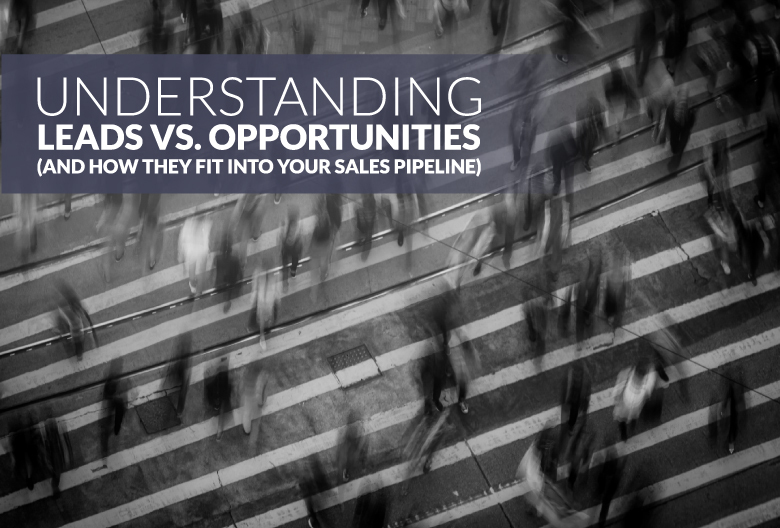 Let’s look at how leads and opportunities move through each step of your typical five-stage sales pipeline. In the context of your sales pipeline, leads are generally found in the first and second stages: initial contact and qualification. 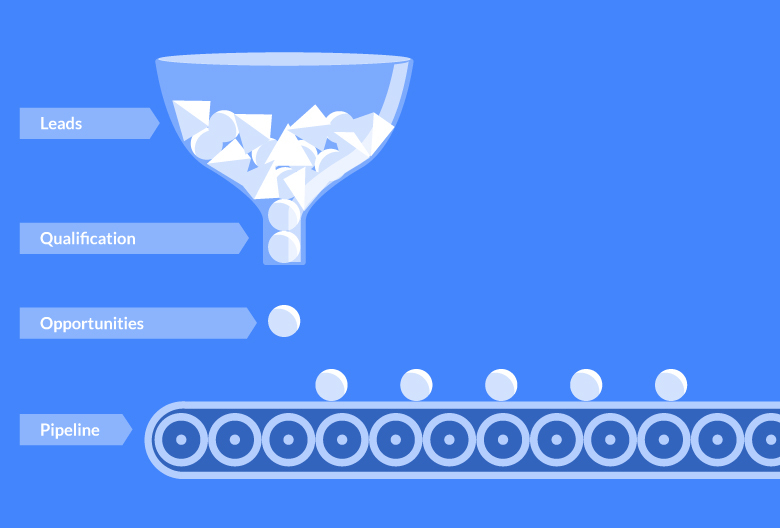 When a new contact enters your sales pipeline, they almost always begin as a lead. Then, as they perform certain actions or check certain boxes, you can qualify them as a potential customer and they graduate to opportunity. Leads that don’t meet qualification criteria either remain leads or exit your pipeline altogether. Every company should develop a lead scoring model that makes sense for its specific products and goals. However, you can use a simple system like the BANT framework until you refine your own lead scoring model. Based on BANT, you should ask qualifying questions that help you determine whether a lead has the right budget, authority, need, and timeline to make a purchase from you. Leads that express interest and meet your qualification criteria turn into opportunities. A meeting or sales demo gives you the chance to further qualify a lead to determine whether or not they’re a legitimate sales opportunity. Sales qualified leads, or SQLs, are ready to have a more in-depth conversation with someone on your sales team – at which point they can be considered opportunities. Once you’ve completed your sales demo, it’s time to present an offer, negotiate, and send over a proposal. Keep in mind that prior to closing, opportunities are likely to come to you with their questions, concerns, and even doubts. Instead of getting frustrated, remember that the finish line is in sight and every sales objection you address brings you one step closer to landing a new customer. This is the stage where opportunities either turn into customers or exit your pipeline as a closed-lost deal. If you successfully seal the deal, you can move the opportunity into the closed-won stage of your pipeline and celebrate a job well done. Either way, you should move closed opportunities from this stage to the closed-won or closed-lost step to keep your pipeline neat and organized. Do you know how to qualify leads and identify real opportunities? Your qualification process should involve asking the right questions to find out the information you need, comparing prospect characteristics to your ideal customer profile, and noting a prospect’s willingness to take certain actions. If you need some inspiration for qualifying questions, here are a few questions to consider asking when trying to gage interest levels from leads and opportunities. Another term that often gets thrown around with lead and opportunity, “prospect” can actually mean different things in different contexts. Understandably, this can create some confusion. Some people think of a prospect as a target that’s even less qualified than a lead, while others think a prospect falls somewhere in between a lead and a fully qualified opportunity. To make things more complicated, plenty of sales reps use prospect and lead interchangeably. So, what’s the definition of a prospect? A prospect is any individual or company that matches one of your buyer personas. They fit into one of your customer profiles in terms of industry, company size, job title, revenue, etc. This is the case whether you’ve already contacted them or not. Prospects don’t become prospects once you add them to your list – they’ve technically been prospects all along. Think about it this way: a lead is not necessarily a prospect if they don’t fit your customer profile. As you research and learn about a lead, they may or may not prove to be a viable prospect. You must then qualify these leads or prospects to see if they are worthwhile opportunities. So, yes, “prospect” and “lead” are certainly interchangeable in some cases because it’s possible to be both at once.